One of the interesting discussions that came out of my recent post about perfume snobbery was the inevitability of brand influence. We most of us have our favorite perfume brands, and we get excited when they launch something new (and, of course, we are disappointed if the something new turns out to be dull and unexciting). It is nice to be surprised once in awhile, but then, life is just easier and simpler when Burberry's The Beat turns out to be appropriately Burberry-ish, and so on and so forth. It might be interesting if you picked up Ralph Wild and found a weird little milky wood pudding with incense and Costume National 21 turned out to be a strawberry soda, but it certainly wouldn't help you navigate the overcrowded fragrance market, would it? And I am still puzzling over Guerilla 1 & 2 from Comme des Garçons. Would I have been more impressed if they had been released by say, Calvin Klein? I think not, but they certainly couldn't live up to the iconoclastic heritage of Comme des Garçons. Comme des Garçons has long been one of my favorite niche brands, but I've grumbled about almost everything they've done lately. I didn't like the Guerilla series mentioned above, and I didn't like the Sweet series that preceded it or the one-off Play fragrance which followed. The Luxe series (Patchouli & Champaca) fragrances were well done, but given that I'd have to sell a kidney to buy them and that they weren't the sort of quirky little wonders I expect from Comme des Garçons anyway, I grumbled some more. With their last two releases, 8 88 (and we're just going to call it 888 from here on in, ok?) and Monocle x Comme des Garçons Scent One: Hinoki, Comme des Garçons is back in my good graces — and I'm sure they're so relieved. I'll start with 888. This is the one that was meant to create an "olfactive expression" of gold. The juice, by perfumer Antoine Lie, focuses on safraline, a "molecular derivative of saffron created by Swiss perfume house Givaudan"; other notes include pepperwood, curcuma, coriander, geranium and amber. It starts off bright and spicy — saffron, yes, but also lots of pepper and coriander — with sparkling citrus and a touch of greenery. It is more sheer than rich, but the spices lend it a jagged, almost rough feel in the early stages. The citrus and the pepper fade as it dries down, and the jagged edges give way to a smooth, almost-velvety finish of pale woody amber-musk. After an hour or so, it is rather quiet and close to the skin, and the gorgeous saffron-coriander blend is creamy and just slightly sweet. It is savory but not foody, if that makes any sense. If you had to assign it a color, golden yellow would do, but other than that there is nothing about it that reminds me of gold, and while it is somewhat cold, it doesn't strike me as particularly metallic. I can't say I adore 888 wholeheartedly, but I like it and I'd certainly wear it, and it is considerably more fun (and Comme des Garçons-ish) than the lackluster Play. Monocle + Comme des Garçons Scent One: Hinoki (what a name! ), created for Monocle magazine ("a global briefing covering international affairs, business, culture and design"), ups the ante: this is the one I'd very much like to own. I don't know what the link is between Monocle and the "Japanese hot-spring baths and Scandinavian forests" that reportedly inspired Scent One: Hinoki, but the juice was created by perfumer Antoine Maisondieu, and the notes include cypress, turpentine, camphor, cedar, thyme, pine, Georgian wood, frankincense, moss and vetiver. If you've a more romantic bent than I, you might find those Japanese hot-spring baths and Scandinavian forests in Scent One: Hinoki, but to me, this is the smell of your father's woodshop, assuming you had a father with a woodshop. On a hot, dry, day, perhaps, when the air is still, and the scent of newly constructed wood furniture mingles with the scent of old wood being refinished. There is freshly sanded wood, and a touch of citrus cleaner, and, as advertised, plenty of turpentine and camphor. The base has a beautifully earthy buzz, and it is all drier than dry. It is exactly the sort of oddity that I adore from Comme des Garçons, and for that matter, exactly the sort of oddity that makes me go on doggedly trying new perfumes every day even though most of them are just dull as dirt. Scent One: Hinoki's lasting power is less than fabulous, isn't that the way? I'm trying it from a vial, and am going to hope it does better sprayed. If you want another opinion on Scent One: Hinoki, see Patty's take at Perfume Posse. 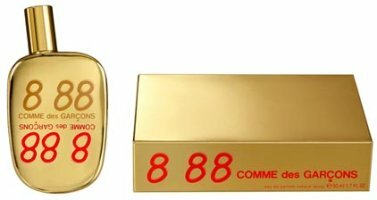 Comme des Garçons 888 is available in 50 and 100 ml Eau de Parfum, and in a matching candle. Monocle + Comme des Garçons Scent One: Hinoki is available in 50 ml Eau de Toilette. For buying information, see the listing for Comme des Garçons under Perfume Houses. As 888 is concerned: I am allergic to both saffran and curcuma. If that is in food I get a terrible rash and whatever gold they may derive from those two…I am not trying, let alone buying it.. I guess it is quirky in the sense that a) it has what might be considered offbeat notes, such as turpentine, and b) it is really, really dry and woody. So, sort of like wearing a hunk of wood. Smells fabulous to me, but is not your average masculine dept store scent, you know what I mean? But I do think if you tried CdG 2 Man again, you'd be surprised at how scary you once found it. Very interesting, as a kind person sent me a diluted sample of Safraline and it gave me a NASTY itchy rash that took 3 days of cortisone to heal. Was almost afraid to spray on 888 after that, but luckily, no further problems. Robin, what kind of wood do you think it smells like? By the way, I so love the smell of any fresh dry cut hunk of wood ! Mostly cedar, some pine/fir. I can make out a tiny bit of cypress, but only for a short while and don't think I would have noticed if it wasn't listed. Don't even know what Georgian wood smells like. And if you love “hunk of wood”, do try CdG Sequoia! I like the smell of turpentine, saw dust etc. even though my dad has never had a wood shed. I remember Kevin's review of my beloved Bel Ami where he pinpoints the lovely turpentine accord; BA also has cypress and cedar… As for the “hunk of wood”, I get that from the far dry down of Chene and absolutely adore it. I'm going to mix the two now for my own home version of Hinoki, LOL! And you are probably right about the Man 2. I mean talking about woods and their smells. Didn't think the 8 88 was especially golden, either. I don't think I'd wear it, but I didn't dislike it. It just left me slightly puzzled and not terribly moved. But I'm looking forward to trying the Hinoki. What a nice story, M! I love the smell of cedar too. I really enjoyed these two. 888 is so unexpectedly creamy; it felt a little like a white floral, only more twisted and fun. However, I couldn't get over how much it reminded me of AP Maitresse–and not just because of the packaging. I suppose it's the soft synthetic quality they have in common. Hinoki was even more compelling. You know, there are times when you don't want anything *wet* in your scent, and Hinoki is dry as a bone. I just found it really peaceful. Sexless. Understated. As you said, infinitely wearable. K has promised to send me some Bel Ami, so will smell that one soon hopefully. Chene is sweeter & smoother than Hinoki, that much I can say for sure — would guess that many people would find Hinoki more masculine. It is funny — several people have said how floral 888 is to them, I don't notice anything floral until very far into the dry down, when it does get a creamy white floral feel to it. Hinoki *is* very peaceful and calming. Would make another nice 'reading in bed' sort of scent, like Diptyque Tam Dao. I liked Hinoki more than 8 88, but not that much more. Patchouli was the recent CdG that impressed me the most. But I am saving my kidney for something else, I think. Hinoki has been tempting me since it's launch, but your review has taken that temptation down a few notches; I sometimes like something a bit creamy in the mix to blend out the rough, acrid edges of the wood. And your comment on the lasting power being less than fabulous is definitely disappointing considering the price ($145 for 50ml). Would you say the moss and incense in this are almost imperceptible? I still want to try it, but if it's really as simple as a hunk of cedar wood, I might stick with something like CBIHP's Cedarwood Tea. I was hoping for more cypress & greenery in this, and maybe less turpentine & camphor (mothballs?). Thanks for the reminder that I need to try CdG Sequoia. That and Palisander have been on my list awhile. I do love the wood scents. And there you go mentioning Tam Dao, again, too. Sigh… what to buy next! Not so simple as a hunk of cedar, but then, nor is it creamy (if you want creamy, do try the Costume National 21), and the opening is definitely rough (in a good way to me, maybe in a bad way to you). Incense is perceptible. Would not have picked out moss in particular, but the base is definitely earthy. And lastly, seriously hate to complain about lasting power when I haven't tried something sprayed — it can make such a huge difference. Without pouring on the whole vial, it is hard to replicate spraying it on. Just smelled Hinoki yesterday (the SA said they SOLD OUT at the shop I went to…all they had was a tester!) and I thought it was nice but I need more to sample to figure out if I need to own it. I found it shockingly similar to Jaisalmer (Incense Series) by CdG but with turpentine. And I think the turpentine gave me a headache…but I will have to re-sniff to be certain. I like – but I'm labelling this as a 'maybe' right now. My wallet is sighing in relief. 888 was sheer, weightless, non-metallic to my nose and reminded me of one of those White Linen flankers Lauders been churning out (White Line Pure Breeze Mountain Snow River Forest) – but I must agree that the saffron note gave it a little edge that I liked. LOVE the bottle. Interesting — I found Hinoki much less “exotic” than Jaisalmer, for lack of a better word, but will have to try them together. The 888 packaging is really wonderful. And LOL at “White Line Pure Breeze Mountain Snow River Forest” — perfect! I'd been extremely curious about buying these perfumes online, blind. I'm a person who needs a strong fragrance that sticks and lasts, so your review of Hinoki was good to know that although I may sample it one day soon, it may not be for a lasting choice for me. 8 88 sound interesting, but again, I'd like to sample it before buying. I love CdG and CdG 2MAN, as well as the Incense series, and their perfumes do tend to last on my skin, so I shall look forward to trying these fragrances soon from my local http://www.meccacosmetica.com.au in Perth, Western Australia. As you may remember.. I own a bottle of 888 and I completely agree on your review. Over time I have received many compliments while wearing it, and although it is not as strong as, say, Prada Amber for men, I need to apply 888 with caution, cause if I do it liberally I get rewarded with a slight headache. Still I love it and yes, it does add a “surpise element” to my perfume wardrobe, something from the left field and unexpected to use when one knows not what to wear. And I guess that means I share your feelings about the “spirit” of CdG being a house that produces little oddities in limited quantities. I have not tried Play.. the guerrillas I did and they were VERY soft for my taste, almost too faint. But they were form a sampler, so I should try again. I have not tried hinoki (although I have it in sight, perhaps on a next trip abroad… here it is IMPOSIBLE to get) and guided by your description, I can now imagine what it smells like. And now.. seeing you liked that… have you tried Acca Kappa's Cedar? I had a bottle a couple of years ago, and it was the most lovely and not-punch-in-the-nose cedar scent I have ever had. I certainly wouldn't buy either of these unsniffed if you can help it — do try them first. I have not tried Acca Kappa Cedar, but will look for it. I have a bottle of the Calycanthus, and unfortunately it is starting to turn…time for me to stop buying perfume I can't use up! Well, I got my sample of Hinoki, and suffice to say, within a few hours I was walking out of a shop with a full bottle. It's a return to the kind of CdG that makes me want to laugh out loud at its sheer audacity. I get turps and cedar maxed up to the nth, and then later it calms down and there's even a hint of something floral. But generally, just Wood. I love it. I'm not sure I could wear it in public. But I'm afraid to report that your fears about the staying power were justified – even sprayed on generously, it doesn't hang around for too long. Seems to do better on fabric than skin. Glad you love it, not glad it doesn't last. Ok, will buy some & spray it on a scarf then. I love the Antoines: Lie and Maisondieu. It's how they push the envelope, taking you into new territory, Lie with his twist on the expected and Maisondieu with his olfactive poetry. Haven't tried Hinoki yet but thought 8888 was a lovely scent; warm and creamy and – speaking as one sadly afflicted with headaches as a result of patchouli – was delighted not to get one with this little gem. I found it warm, creamy and ambery. I love their work on the Etats Libre d'Orange range and very much look forward to their next work. I was just preparing for the fall (even though our fall in the Southern part of FL is kind of hot, it still is my excuse to purchase some new perfumes lol) so I was thinking something woodsy. Ok, well I actually feel like purchasing something really WOODY, not too floral/spicy/green i just want those woods, woods and forests. Two of my choices were: chypre rouge and CdG monocle x hinoki. Both of them have never been sniffed by me, but I'm gonna have to order some samples from perfumedcourt or luckyscent or something. I just wanted to see which one would smell more of those REAL woods? For straight up wood, the CdG. Or Serge Lutens Chene. I have to say I was really disappointed by this one. I had expected the terpentine to be more prominent, and the wood to be more “woodshop” and less “forrest full of fir tree”. The citrus cleaning in combination with the forrest-esque smell made this scent remarkably reminiscent to this _really_ cheap spray can air freshener I once had in my household (don’t ask) that was supposed to smell fir tree. Of course, it could just be that the woody scent triggered some bad memories, but to me the whole scent just shouted “artificial”. I have to say, I could live in Hinoki. But then I have the best memories attached to all things woody–my father actually did have a woodshop in the back yard (Robin’s description of that was actually the number one reason I picked up a sample). I was in a sauna one time as a teenager, and this brought me immediately back to that too. I can smell the frankincense very slightly, and there is some very dark green in there, but it’s mostly wood and pine and hot air. It doesn’t smell artificial to me at all–if it did, I don’t think it wouldn’t trigger the memories that it does. I am sad it doesn’t have much staying power, though, because the price tag certainly is a barrier to buying something I’m going to go through so quickly. It may almost be worth it, though, for the memories alone. My dad’s been gone 11 years this month, and this is the closest I’ve been in years to the smells I associate with him. It’s a bit of my childhood in a bottle, I suppose. Oh, how nice that it reminds you of your childhood and your dad! Fragrance can be a wonderful thing.